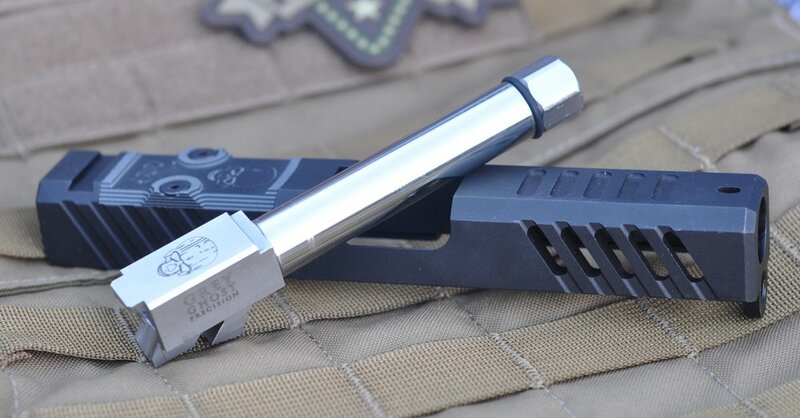 Once upon a time in the Pacific Northwest, Grey Ghost Precision started making Glock slides and barrels. These are for the ever growing market of aftermarket Glock accessories. Well, as luck would have it, they sent me one of their G19 slides and match grade barrel for review. Because they sent both a slide and barrel, I am discussing both of them as one. This slide is just beautiful! Okay, very useful also. They make the slide out of 17-4 stainless steel and black nitride coat it inside and out, hence the good looks. Since it is nitride coated, it should wear very well with even the hardest of use. It is a stripped slide, so all internal and external parts must be added. The slide I received was the V1. The V1 has angled front and rear cocking serrations. The front serrations are cut through the slide and gives a nice look of the barrel showing through. I really like how deep all the serrations are cut. You can really get a good purchase on them when cycling the slide or doing failure drills. There are also some grooves cut on the top front of the slide to help with user function. Grey Ghost also makes a V2 version that has a golfball style texture for grip. The V2's pattern does not extend through the slide. I ended up mounting the combo on a Polymer 80 frame. Basically, it slides right on. The first really noticeable attribute, was how tight the lock up of the Grey Ghost barrel and slide were. Way better than any stock Glock I have used or felt. Since the slides are made to tighter tolerances, I wasn't super surprised. I don't know exactly what other magic they did, but the slide to frame fit is super tight and smooth. 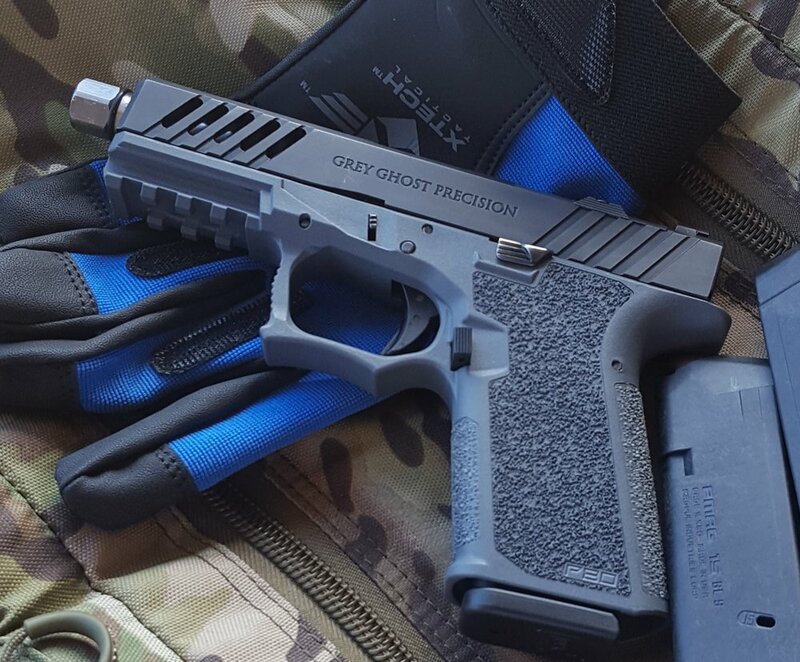 Grey Ghost makes the slides with or without an RMR cut. The one the sent me has the slide cut for a Trijicon RMR. Rumor has it that Grey Ghost is also working on different red dot sight cuts. So, DeltaPoint Pro and Vortex maybe. I didn't use an RMR on it. But, the slide comes with a pre-installed cover plate. 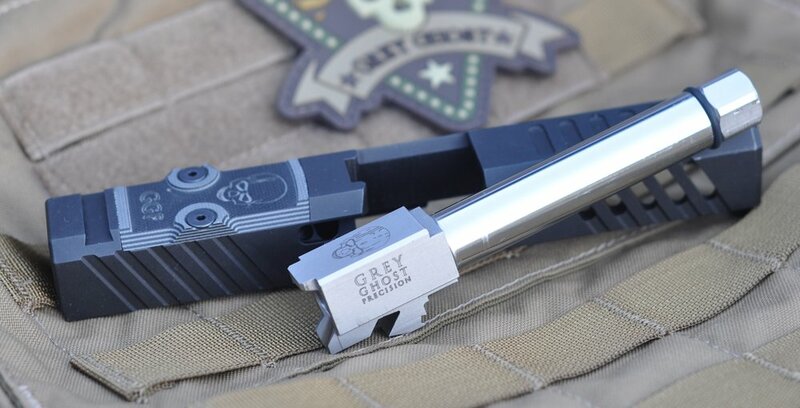 The cover plate is made out of G10 and has the Grey Ghost Precision logo laser engraved on it. For those of you that don't know what G10 is, it is a resin based composite used for handgun and knife grips. The non RMR slides also have the "ghost" lased on them. As does the Grey Ghost barrel, it is also engraved with the GGP logo. Grey Ghost tells me that they have seen an average of a 30% increase in accuracy over stock. This seems to be a pretty bold claim, but I believe it. I shot an offhand, 3" 5 shot group, at 25 yards. It was consistent at that range with different types of ammo. That is really good for me with blurry sights (I have aging eyes). I also have no problem shooting a 6" plate rack at 20yds with the slide/barrel combo. When I move the target in to 7yds, it shoots one ragged hole, if I do my part. The slide functions extremely well also. I just used a stock recoil spring assembly and only had 2 problems running 165 subsonic ammo (it shoots really light and is intended for suppressor use). It runs the 165's fine now, so maybe the slide just needed a little break in period. When I ran 115, 124, and 147gr ammunition through the pistol, it functioned without a hitch. The ammo was a variety of factory, handloads, and even some +P hollow points. I have around 600 round through it as of this writing, mostly 115 and 124's. Grey Ghost's barrel is also a thing of beauty. They sent a 416R stainless steel threaded barrel. Yes, threaded 1/2-28 for a suppressor or compensator. They only list black, unthreaded on the website, so ask them if you want something different, I am sure they can help you out. These barrels use a proprietary twist rate, so who really knows what it is. But, I don't think it matters because of how well it shoots all different weights of 9mm. It also uses SAAMI spec match chambers and is cut to within +/- 0.003". When combined with the tight specs of the slide, you get a wonderful shooting combo. I discussed how well the slide/barrel shoot. So I'll give some experiences while shooting. I have cycled the slide in the rain without feeling like my hand was going to slip off of the serrations. It is definitely better than the original small lines on a 1911. It shines while wearing shooting gloves. It almost feels like the gloves get caught in the grooves and really enhance the grip on the serrations. Performing press checks, using the front serrations, works well, if that's your thing. These slides and barrels are available for Gen 3 and Gen 4 G19's and G17's. I really can't say enough nice things about the barrel and slide, they are really that nice. The black Nitride is better looking than a standard Glock finish. The slide has a good functional design. So if you are in the market to modify or build a G19, definitely go check out Grey Ghost Precision and what they have to offer.